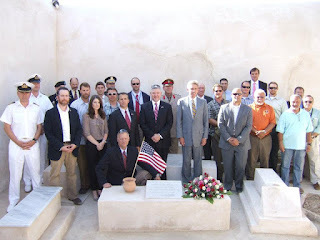 New US Ambassador to Libya Chris Stevens leads a delegation from the US.S. Embassy at the graves of the men of the USS Intrepid at Old Protestant Cemetery in Tripoli on Memorial Day 2012 . 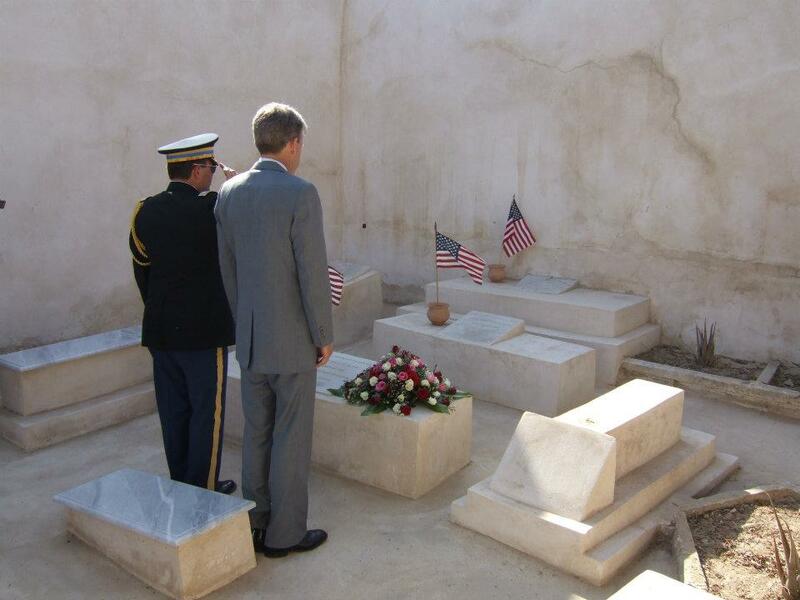 Ambassador Stevens pays his respects. Many thanks to Joe Tordella, Deputy PA Officer and Brian Linvill LTC, USA, US Embassy Tripoli for these photos and for the US Embassy staff for all they have done to secure and maintain this site and honor these men. The North African nation of Libya, whose successful revolution against long-time dictator Muammar Gadhafi is currently threatened by militia violence and regional separatism, will soon have a new US ambassador with extensive personal experience in Libya. John Christopher Stevens, a career member of the Senior Foreign Service who has served two tours of duty in Libya, was nominated by President Obama on January 23. His Senate confirmation hearing has been scheduled for Tuesday, March 20, 2012. Born in April 1960 and raised in northern California, Stevens earned his undergraduate degree at the University of California at Berkeley in 1982, a JD from the University of California’s Hastings College of Law in 1989, and an M.S. in National Security Studies from the National War College in 2010. He was also a Peace Corps Volunteer, teaching English in Morocco from 1983 to 1985. Prior to joining the Foreign Service in 1991, Stevens practiced international trade law in Washington, DC, for several years. At the State Department, Stevens’ early career foreign postings focused on the Middle East, including service as consular and economic officer at the embassy in Riyadh, Saudi Arabia; consular and political officer in Cairo, Egypt; political officer in Damascus, Syria; and deputy principal officer and political section chief at the consulate in Jerusalem, Israel. At the State Department in Washington, Stevens has served as a staff assistant in the Bureau of Near Eastern Affairs (1996), Iran desk officer, and special assistant to the under secretary for political affairs. From late 2006 to May 2007, Stevens was on detail as a Pearson Fellow to the Senate Foreign Relations Committee, where he served as minority staff advisor on Middle East affairs, reporting to Senator Richard Lugar (R-Indiana). For his second tour in Libya, Stevens was sent to rebel headquarters in Benghazi, Libya, to serve as special representative to the Libyan Transitional National Council. He arrived on a Greek cargo ship on April 5, 2011 and stayed until November. His mission was to forge stronger links with the Interim Transitional National Council, and gain a better understanding of the various factions fighting the Gadhafi regime. His reports back to Washington were said to have encouraged the U.S. to support the rebel council, which the Obama administration did formally in July 2011. Stevens speaks Arabic and French. MR. TONER: Hey. Good afternoon, everyone. Welcome to the State Department. It’s our good fortune today to have with us Chris Stevens, a man you’ve heard a lot about over the past several months, as he has been the U.S. representative to the Transitional National Council and been working with them on the ground in Benghazi. So we thought it was – would be helpful and important to have Chris come and talk about his experiences and to answer some of your questions. So without further ado, Chris, thanks. MR. STEVENS: Thank you. Hello. Good afternoon. I’m Chris Stevens. I got in from Benghazi a couple of days ago, and I’m in town for consultations in the Department. Just briefly, I’ll say a few words at the top. I’ve been in Benghazi for about four months now. We got there April 5th. It was difficult to get in there at the time. There weren’t any flights. So we came in by a Greek cargo ship and unloaded our gear and our cars and set up our office there. So we’ve been on the ground since then. My mandate was to go out and meet as many of the leadership as I could in the TNC. They’ve got their council, which is sort of their legislature, and they’ve got a – sort of a cabinet. So I’ve met just about everybody in those two institutions. And then I’ve gone around and – with our small team – and tried to get to know other people in the society there. Of course, we operate in eastern Libya, not the part that Qadhafi controls. And the immediate concern when we got there was that Qadhafi’s forces had almost infiltrated and taken over Benghazi, but were pushed out by NATO. And since then, the situation has improved quite a bit. Real briefly, I’ll say that in the last four months, my strong impression is that the TNC are making progress, and I sort of break it down into three areas. Diplomatically, they’ve made tremendous progress since April gaining international recognition now from about 30 countries, including, significantly, our own. This helps them in the eyes of the world, in the eyes of their own people, in the eyes of the Libyan people who are still under Qadhafi’s rule, and it also helps them in the sense that it increases the pressure on Qadhafi. Financially, they’ve made progress. And when we got there, they were really in a precarious situation because they didn’t have funds to pay for food, medicine, fuel to keep the power generators going to keep the lights on. And since then, a number of countries have come forth and offered loans, most recently Turkey and Qatar and the UAE and Kuwait. And of course, with political recognition, they’re hopeful that they’ll be able to gain access to the frozen assets around the world. And then lastly, I would say militarily – although it’s been slow – they’re also making progress gaining territory from Qadhafi. And the way I sort of break it down is there are three battlefronts. There’s the Western Mountains, where they’ve got fighters inching their way towards Tripoli. There’s the Misrata front on the coast, where they’ve not only fought off Qadhafi’s forces successfully, but they’re also pushing west up the coast towards Tripoli. I understand they’re getting close to Zliten, which is a significant town. And then closer to where I am, there’s Brega. And they made a push just as I was leaving Benghazi towards Brega, where they’re now encountering difficulty with landmines, unfortunately. Hopefully, they can get through those. Now, I don’t want to paint an overly rosy picture because there are also challenges inside the TNC-controlled area, and one of them is security. There was a security vacuum when the regime fell, and they had to stand up very quickly this organization called the TNC. The police, for the most part, just left their posts because they were afraid of popular reaction against them because they had committed abuses in the early days against the people. So there’s hardly any police around, and because of that vacuum, militias started to form and step in. And so looking after the security of Benghazi and eastern Libya, you’ve got a lot of militias and a few police. And this had led to some security challenges that you’ve already read about and know about, I’m sure. And the TNC is working to address these problems. We’ve flagged the problems with them. The British, the French, other diplomatic missions there are sort of keeping the pressure on the TNC to get their arms around the militia problem so that they can provide better security as they try to move forward to Tripoli and hopefully to Qadhafi’s departure. MR. TONER: Kirit, go ahead. QUESTION: Thanks. Kirit Radia with ABC News. I had a question for you about the numerous reports of fracturing within the TNC and some different factions that have been potentially clashing against each other, most notably in the case of the security official who was assassinated the other day. I was curious if you had any insight into just how fractured the TNC might be and what the U.S. is doing to help unify them. MR. STEVENS: Yeah. My impression is really a little bit different. The TNC really is a reflection of Libyan society. Libyan society is not monolithic; it’s made up of lots of different people, lots of groups, different points of view. So this was never a monolithic group that we were dealing with, and I realized that from the start of our mission and we reported this through channels here. So it’s not surprising to me that there are differences of opinion. The problem, of course, arises when they express their differences of opinion in a violent way. And with respect to General Younis’s killing, we really don’t know who did it. I mean, they – I know there are some statements out there, but the TNC has set up a committee to look into his killing and to ascertain what the truth is. So I’m really hesitant to kind of jump to conclusions about whether it was an inside job or a Qadhafi job or anything until we really know. On your last point, we have gone in to the TNC leadership with our partners on the ground there and communicated the view that they really need to be careful about maintaining their unity and keep the focus on Qadhafi’s ouster. And they understand that message very well and they have told us that they are going to work hard to bring the militias under the control of the security ministry which they’ve set up and under the army as well. And hopefully that will work. QUESTION: Do you have any concern that the factions that are within the TNC could weaken it to the point where they aren’t able to act in any sort of unified way against Qadhafi that would impede their progress or their ability to even provide services as well on both fronts? MR. STEVENS: No, because the militias that are troublesome are really quite small. The main militias are working in coordination with the TNC leadership and under the leadership of the defense ministry there. That’s the first point. The second point is the militias – there are any number of them and they sprout up all the time and it’s pretty much anytime a few guys get together and identify a name to attach to their group. And oftentimes they work only in a neighborhood context. So I don’t see them as posing a huge security challenge right now. QUESTION: Well – sorry, it wasn’t the militias that was meant. Within the TNC leadership, any sort of factionalization within the TNC leadership that would impede their ability to either make decisions on behalf of the group or to advance against Qadhafi. MR. STEVENS: No, I don’t see that as an issue. As I said, the main ones are with the TNC and they’re on the front lines not only in Brega but also they’re sending fighters out to the western mountains and to Misrata. So they’re with the cause. QUESTION: Just kind of taking a larger picture, I mean, it does seem in the last few weeks that kind of despite their nice plans and papers and proposals and meetings that they’re having, that there does seem to be some kind of disarray on the ground. And I think it probably stems from the fact that there has been so little of institutions or any type of government in Libya for so many years that these people are not really used to kind of all working together towards a common goal. MR. STEVENS: Right. Okay. First, it’s – I think it’s really important to remember that the TNC sort of emerged out of emergency circumstances back in February, and they tried to set up government institutions in very difficult circumstances, while they’re fighting a revolution, while they’re fending off Qadhafi, while they’re trying to gain international support. So I actually think they’ve done pretty well considering the challenges. But your point is correct in a sense that Qadhafi never encouraged institutional development. He did the opposite. He really demolished his government, as you know from your visit there a few years ago. So they are struggling with that. We and other international partners are trying to help them in various ways. The main vehicle for that is the International Contact Group which meets once a month, and there are discussions about what kinds of technical assistance could be provided to help them sort of buttress their institutions, which, by the way, are meant to be temporary because they weren’t elected. They’re not considered the elected government. They’re meant to be transitional. So there’s a sensitivity there. And then on your last question about how big is our group, we’re eight people now. We’re quite small, but we hope to get a little bit bigger. QUESTION: Just a quick follow. I mean, in terms of you working with these people and helping them kind of maintain their unity, I mean, even though they’re the biggest game in town, I mean, how much support do they really have throughout the country? I mean, although they’re certainly the most well known, I mean, would you say that this is an adequate reflection of representation of the Libyan people? MR. STEVENS: Yes, I would. First of all, there’s no alternative except for Qadhafi and he is extremely unpopular throughout the country. Second, the TNC has representatives from Qadhafi-controlled Libya on its council, in its government, and they’ve actually recently increased the size and the representation of the TNC among the western provinces. And they’re very conscious of this sensitivity of not being sort of overly dominated by eastern Libyans. So I think they are representative. QUESTION: Steve Myers. Sir, short of jumping to a conclusion, can you tell us what you do know about the killing of General Younis? The circumstances are very murky, as you know. And what effect have you seen so far in the week or so since that’s happened on the military leadership of the TNC? MR. STEVENS: Well, I don’t want to speculate. All I’ve seen are a couple of reports, one by the TNC leadership that a Qadhafi-affiliated militia killed him, another by somebody else who said it might have been one of the rebel militias. And I don’t really know what the truth is. I think we have to wait and find out. In terms of the impact of his death on the military leadership in – among the rebel ranks, I understand that they have selected or are looking at a general who is in charge of the Tobruk region in the eastern part of the country, but I don’t know if he’s been confirmed, so to speak. QUESTION: Hi. Mary-Beth Sheridan from The Washington Post. So can you give us a sense at this point – what is your sense of how much longer it will – the sort of conflict is likely to go on before Qadhafi leaves? I mean, three months, six months, a year? MR. STEVENS: I wouldn’t want to put a date on it, but I can tell you what the TNC hopes to be the sort of end game. Their – what they envision is increasing pressure on the Qadhafi regime such that more and more of the leadership flee and such that Qadhafi will give up. And the pressure is political, his increasing isolation; it’s financial, and it’s even military as the rebels try to move down closer to Tripoli from the mountains and then up from the coast. QUESTION: And if I could follow up also, I – it’s been referred that the U.S. had suggested in its talks with the Qadhafi government the possibility of Qadhafi staying in the country. Is that something that you’re still willing to offer to them? MR. STEVENS: Well, our position is that it’s a decision for the Libyan people and their future government where Qadhafi resides. QUESTION: Camille Elhassani from Al Jazeera English. In your talks with the TNC, have you gotten a sense that they would accept Qadhafi to stay? And then also I have a couple more, but I’ll just start with that one. MR. STEVENS: Absolutely. We try to get out about as much as possible, so – and meet with all sorts of people – tribal leaders, Islamists, NGOs, women, men, all around. So Benghazi, but also we’ve headed out into the east. Where we don’t go, for security reasons, is into the warzone. QUESTION: Are they telling you what kind of government they want post-Qadhafi? MR. STEVENS: Yep. Democratic, where they have a say in their lives, which they didn’t have for the last 42 years. MR. TONER: A few more questions. Said. QUESTION: Sir, how do you and the other diplomatic missions accredited in Benghazi liaise with the TNC? Do you have – do you coordinate your efforts? Do you talk to them on daily basis? Do you deal with them as a government? And would you recommend to the Administration, to the United States Administration, to open up the embassy as soon as possible in Washington so you can have better coordination? MR. STEVENS: Well, we talk to them on a daily basis. MR. STEVENS: We talk to the other missions as well. QUESTION: To set priorities and so on? MR. STEVENS: Yeah, yeah. We – of course, in the Contact Group, where – there are a number of nations and those nations are represented in Benghazi and we do talk amongst ourselves, how can we work with the TNC to forward the goals that everybody agreed on in the Contact meeting. So yes, a lot of talk among all of us. And as for their mission here, I understand they’re going to be opening up their office again pretty soon. QUESTION: Paul Richter with the LA Times. Is the U.S. doing any systematic planning for what happens after Qadhafi leaves? MR. STEVENS: Yes. But first, I really want to say that the TNC is also doing planning for the future, and that’s probably more important. They have done extensive planning about how to handle the situation in Libya in the immediate aftermath of his fall and then beyond that. It’s – they’ve done a political roadmap to how they’re going to get there, and then they’ve done very specific sector-by-sector planning. So that process is underway. We and our international partners are working with them in the Contact Group to help them and to give ideas and – based on our experiences. They’re very open to that kind of cooperation. And of course, the UN is very involved and will be very involved in the post-Qadhafi era. QUESTION: And how much of a role is the U.S. willing to play? Are you leaving it to the Europeans, or is the U.S. willing to do a substantial role in helping maintain security in the immediate aftermath? MR. STEVENS: Well, I think we have a lot to offer, based on our own experiences. And my understanding is that we’re going to be doing this as part of a joint effort with other international partners. As I said, the Contact Group is kind of the venue where this – these discussions take place and the teamwork is formed. MR. TONER: (Inaudible) more questions. Cami. QUESTION: I’m just wondering – this touches on some of the other questions that were asked, but – and we keep hearing that the NATO militarily – the mission is in a bit of a stalemate and – Qadhafi’s forces and the opposition forces. And more people are saying it will have to be a political solution. I’m just wondering what the TNC tells you about that. Do they feel the same way? Do they feel that they’re also in a stalemate? And if they are looking at a political solution, what specifically are they thinking of? MR. STEVENS: Well, they are of the view that they’re actually making progress towards ousting Qadhafi, because they’re – they and with everyone else who’s help, are increasing the political pressure, the economic pressure, the military pressure. So they don’t see a stagnant situation. They see movement in the right direction. They’re very glad that NATO is a part of this, and they see NATO’s continued involvement as essential to protecting them, their people, and they hope it continues. QUESTION: But did they expect it to last this long, the military involvement by NATO? MR. STEVENS: Well, they had hoped that Qadhafi would be gone a long time ago, but they’re patient and they’re committed. QUESTION: And so the second part of my question was, politically, what are they willing to do to bring this to a conclusion? MR. STEVENS: Well, they’re trying to do all they can with all the fighting on the various fronts. And they’re trying to show the – continue to show the international community that they’re worthy of our support. QUESTION: What percentage of the TNC, this reflection of Libyan society, is now composed of women? Secondly, have they told you how they want to use the billions of dollars they’re hoping to get access to? And thirdly, how do you draw the assessment – or how do you reach this assessment that Qadhafi’s demise is an inevitability at this point, beyond that you want this to happen? MR. STEVENS: Well, the percentage of women in the TNC is very small. I can tell you that. I’d have to look carefully at the lists of who’s in the different structures, but it’s very small. I know one TNC woman who’s a – plays a prominent role as head of the legal affairs committee, and she’s very involved in the discussions about political planning for the future. Women are more represented in civil society groups there. So that’s that. And then can you remind me of the other questions? MR. STEVENS: Oh, yeah. Yeah. MR. STEVENS: Right. Right. They have specific plans and priorities for how they would spend the money. Generally speaking, they would spend it on their urgent priorities, which are fuel so they can keep the electricity going, and the water pumping. By the way, they get their water, most of it, from the great manmade river, which is pumped out of the – out of desert aquifers in the south. And that all takes a lot of electricity. And on medical supplies and medication, which they’re running short on, and on food subsidies, and on supporting internally displaced Libyans from the West who fled to Tunisia, that’s a big issue. So that’s how they would spend the money. And then on the inevitability of Qadhafi’s departure, I don’t – all I can say is that the world is lined up against him and his base is shrinking, and the TNC forces are closing in around him, and so are sanctions and other things. So I think everybody agrees it’s a matter of time. QUESTION: Thanks. Just a quick one. There are some reports that some of the military in the TNC actually themselves are carrying out human rights violations. Is that correct? To what extent are they? And how effective are the TNC in terms of controlling their own forces? MR. STEVENS: -- making sure it doesn’t happen. QUESTION: But I mean, is that a surprise? I mean, some of them are former Qadhafi loyalists who committed abuses under Qadhafi, so they don’t just change their tactics even though they might not like working with Qadhafi anymore. They don’t exactly change their tactics overnight, do they? MR. STEVENS: Well, it’s an education process and education takes time – repetition. QUESTION: Given that the international criminal court has issued an arrest warrant for Muammar Qadhafi, do you have any idea of who might represent that country at the UN General Assembly this year? Has that been any part of discussions? MR. STEVENS: It’s not been part of any discussions I’ve had in Benghazi. I’m sorry, I don’t know the – don’t know. QUESTION: How’s the help you have been receiving from the fellow (inaudible) countries in the region? Are you satisfied with it? And also (inaudible) member of (inaudible) Turkey, do you think west and the east are on the same page still? MR. STEVENS: Well, the – I can tell you the TNC is very pleased with the support they’re getting from some countries, including especially Qatar, UAE, and Turkey, to name three. They’re playing a big role, a positive role. MR. TONER: I think that’s all we have time for. He’s got other meetings, so I’m going to let him go. We’ll start the daily briefing in just a couple minutes. U.S. 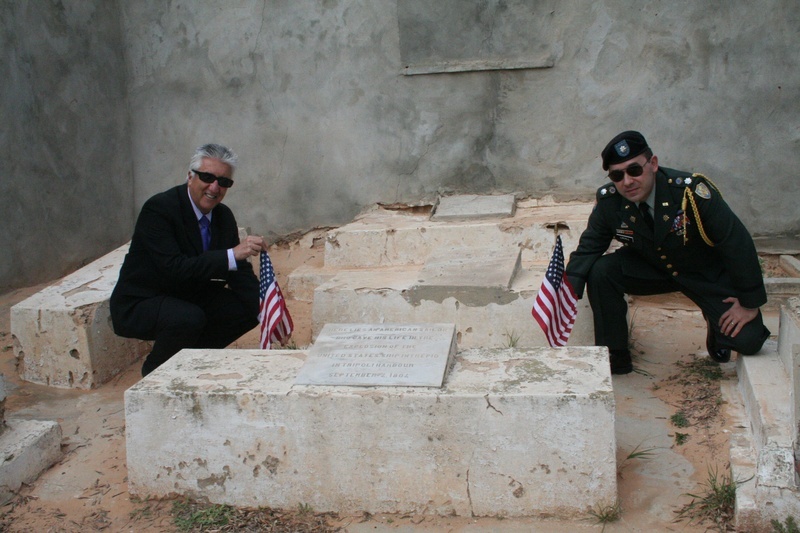 Ambassador to Libya Gene Cretz and US Military attache Brian Linvill place flags on the graves of US sailors from the USS Intrepid at Old Protestant Cemetery in Tripoli on Memorial Day in 2010. The DOD is currently studying the feasibility of repatriating the remains of these men, an evaluation that should be completed by September. This review should include an forensic analysis of the remains in these crypts to determine if they can be positively identified as those of Lt. Richard Somers or Lt. Henry Wadsworth, whose families are requesting their repatriation. The remains of all of the men of the Intrepid should be returned home and properly buried with full military honors. With the current DOD evaluation of the feasibility of repatriation of the remains of the Intrepid crew from Libya Chris Dickon gives a summary of the history of American war dead buried abroad, and notes that when circumstances allowed, what the military has done. The current military study should include an inspection of the Intrepid graves at Old Protestant Cemetery and DNA testing to see if any of the remains can be positively identified. The circumstances now permit such an inspection and testing and they should be conducted, as the window of opportunity might not last. Consideration of what to do about the graves of Richard Somers et al in Tripoli at a time when there may be a window of opportunity to return the remains to the United States can’t easily be put into a historical context. Though official policy of the right of return for the bodies of war dead didn’t reach full force until World War I, all known burials abroad prior to that time have ultimately received more attention and resolution than have Somers and his crew. The shortcoming has been a matter of circumstance rather than policy, and it may be that circumstance for the Tripoli dead has changed for the time being. The crew of the Intrepid were the first named burials abroad of American war dead in the country’s history. Though the remains of perhaps thousands of Americans killed in the Revolutionary War were left in the marshes of the port cities and other locations in England, none could be identified and found today. After the Barbary Wars, in which the Intrepid crew was buried in Libya, it was the War of 1812 that left American dead buried abroad. It can be said that, unlike Somers et al, by the end of the 20th century all of them have been accounted for and memorialized to the fullest extent possible. Joining the list of America’s most honored naval heroes was William Allen, commander of the USS Argus, killed by the British in 1813, but buried by the British, along with his midshipman Richard Delphy, with great honors in a Plymouth churchyard. The location of the graves in Plymouth was lost sometime in the mid 19th century, but their headstones have been preserved in the outer wall of an historic Plymouth building. They have been honored in ceremonies held in common by American and British interests since the time of their deaths, and a bicentennial celebration will take place at St. Andrews Church in Plymouth on June 5, 2013 with the attendance of officials, historians and military of both nations. In that same time frame, 275 American prisoners of the War of 1812 will be honored at the site of their common grave at Dartmoor Prison near Plymouth. That event will also be just one in the continuing attention paid to the Dartmoor men by interests on both sides of the Atlantic since the last half of the 20th century. In addition, 185 American dead of the War of 1812 buried in Halifax, Nova Scotia will be honored as they have since the rediscovery of their common burial ground late in the 20th century. They have been celebrated with the support of the city of Halifax, American, Canadian and British military interests and a memorial including the names of each placed by the US Veteran’s Administration. Among those initially buried in Halifax during the War of 1812 was another historic figure in American naval history, James Lawrence. Precedent was set when, unlike that of Richard Somers, his body (and that of his Lieutenant A.C. Ludlow) was exhumed in Halifax when circumstances allowed and returned to the US where it now rests in Trinity Churchyard in Manhattan. Another precedent of the movement of a mass burial of War of 1812 dead from a foreign land took place in 1988 when 28 American dead found at Fort Erie, Ontario, Canada were ceremoniously moved to a National Cemetery in upstate New York. 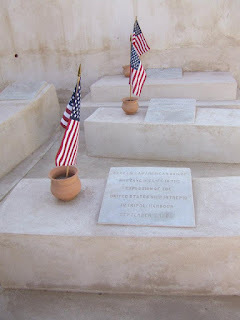 Other known and named naval burials abroad before the official policy of return was implemented are those of approximately 25 crew of various naval ships in a cemetery at Port Mahon, Spain (effectively abandoned by the US Navy and now under the care of American interest groups and the Spanish Army). 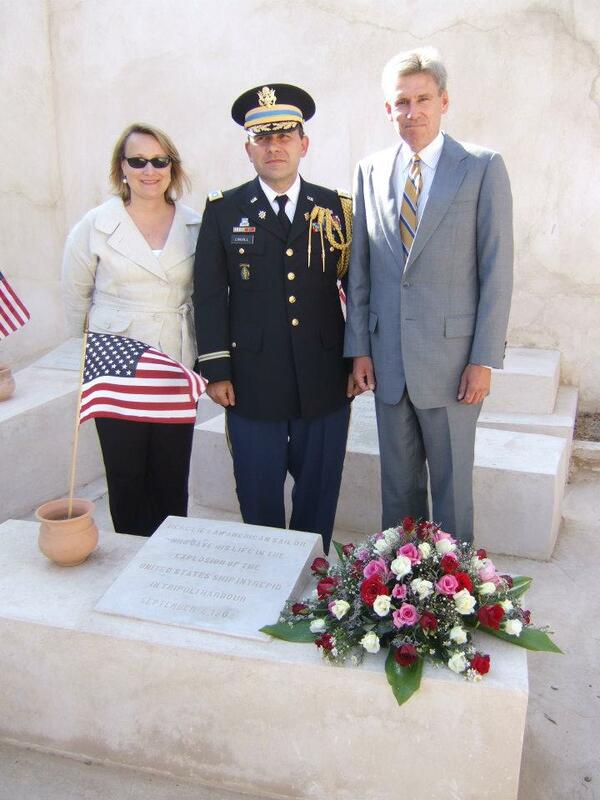 Two named crew-members of the USS Sabine are still buried in Nicaragua. All of these were non-combat deaths, and there are no known families who might want to reclaim these bodies in the present day. It can probably be said that, with the exception of the 27 non-combat dead immediately above, everything that could be done to honor, return, memorialize and take care of the graves of known war dead buried abroad has been done, and will continue to be done in the future. But the full potential of what can be done in relation to America’s first naval heroes buried abroad, Richard Somers et al, may not yet have been reached. Circumstance may have been a key factor in that deficit, but in the case of the others when circumstances have allowed an optimization of their return to American memory or soil the advantage has been taken and well-used. Another important precedent related to Richard Somers is that of the retrieval from Paris of the body of John Paul Jones by president Teddy Roosevelt in 1906. It took several years to accomplish, but the event served to enhance the argument for a US Navy, and to celebrate the relationship between the United States and France at important junctures in each of their histories. Peace with Britain had removed the threat posed by the Royal Navy to American merchant ships, but it had also left them without the umbrella of protection the Royal Navy had provided before 1776. For the first time, the Stars & Stripes were seen on the high seas and in foreign seaports – but the flag was seen flying only on richly laden and defenseless merchant vessels, never on ships of war. Greedy eyes studied the ships of this new nation the way wolves study sheep. The British let it be known that the Americans no longer enjoyed their protection. The wolves were hungry; the sheep were fat, numerous, and slow, and there was not a shepherd in sight. The first attacks took place in the Mediterranean, where piracy had been practiced since the beginning of recorded history. The pirates in this case were from the four Barbary States of Tripoli, Tunis, Algiers, and Morocco, whose corsairs operated out of ancient seaports along the North African coast. Since the Islamic conquest of North Africa in the eighth century, these dusty, sun-drenched little city-states had pledged nominal allegiance to the Sultan of Turkey, but they were largely autonomous. Nested on the edge of the Mediterranean, with their backs to the North African desert, the Barbary States had little agriculture or industry to sustain them. Their traditional livelihood was piracy, and their traditional victims were the foreign merchant vessels that plied the Mediterranean trade routes close to their shores. Captured crew members were transported back into port in chains, where they were imprisoned, put to hard labor, or sold at the slave markets. Women faced the prospect of being raped or sold into private harems. Prisoners who disobeyed or attempted to escape might be burned alive or impaled. That sub Saharan Africans were subjected to the same cruelties by white masters in America did not prevent the news of such attacks from creating a sensation in the United States, where they inspired a genre of lurid fiction and plays. 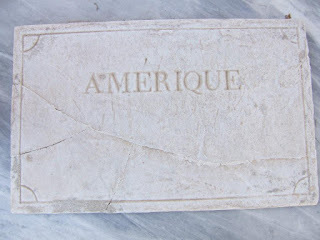 …In July 1785, two American ships, the Maria and the Dauphin, were seized by Algerian corsairs. Twenty-two crewmen were transported to Algiers and thrown into dungeons among the slaves of other nations…American leaders came under pressure to strike back at the pirates, to rescue their enslaved countrymen, and to prevent further attacks…. John Adams me the Triopli Ambassador in London. Though he was able to laugh at the rituals of tribute diplomacy, Adams reached the sober opinion: “it to be wisest for Us to negotiate and pay the necessary Sum, without Loss of Time.” Fighting the corsairs, he told Jefferson, would only compound the economic loses to the United States…. The tactics employed by the Algerian corsairs against the merchantmen were simple, effective, and brutal. They sailed lateen-rigged ships, xebecs, polacres, and feluccas that were fast enough to overtake most prey under sail, but cold also be rowed in a calm. Running down a fleeing merchantman, they dropped their long lateen yards across the victim’s rail. Ferocious men armed with pistols and cutlasses swarmed aboard and slaughtered any who resisted. The captives were beaten, stripped, and chained together belowdecks, and then returned to Algiers, where they were imprisoned or sold into slavery. …Not all Quakers failed to be impressed by the arguments against the peace testimony, and the revolutionary spirit opened a rift within their ranks...One of these renegade Quakers was a forty-two-year old Philadelphia shipbuilder named Joshua Humphries….The frigate Humphreys envisioned would be powerful enough to overwhelm a lone enemy cruiser…When pitted against a battleship, the American frigate would enjoy one of the most important advantages that any warship can ever have: the option to either fight or flee, to outrun or outgun…. Washington…chose the first five names on the list: United States, President, Consitution, and Consellation. The sixth frigate, which would be built in Nortfolk, Virginia, would later e christened Cheaspeake…Knox faced the embarrassing task of informing Congress that, for the second consecutive year, twelve more months were needed to complete the frigates. The United States was one of the city’s most popular sightseeing destinations….Given the United States was the single most expensive military asset in American history, security was amazingly lax. Tourists strolled into the yard as if they owned the place. They mounted the scaffolding, climbed into the inboard works, and chatted with the tradesmen…The launch would be one of the greatest spectacles that the city of Philadelphia had ever seen…. Mon March 13, 1801, nine days after his inauguration, Jefferson received a disturbing set of dispatches from the Mediteranean. Yusuf Karamanli, the Bashaw of Tripoli, had summoned U.S. Counsul james Cathcart to his palace and threatened to send his corsairs out to attack American shipping. The attacks could be averted, Cathcart was told, if the U.S. government would present Tripoli with a cash gift of $225,000 immediately and $25,000 in future annual tribute. In the interest of peace, the Bashaw added, he would wait six months for the American president’s response. Cathcart responded bravely, telling Yusuf that “the meanest of our Citizens would expend their last dollar and lose their lost drop of blood before they would ever consent to become tributary to the Regency of Tripoli.” In the past, however, American ministers had used equally brave rhetoric just before agreeing to new and larger payments to the Barbary powers. Why should the Bashaw assume this case would be any different? (Captain) Bainbridge and the Philadelphia would be sent off to the east with orders to do what Preble’s predecessors had been roundly condemned for failing to do – maintain a rigorous blockade of Tripoli…The commodore …. Had neutralized the Moroccan threat, and he had done so in the space of three weeks, without firing a single shot in anger. Now he had nothing standing between him and Yusuf, and could bring his entire force to bear against Tripoli. As the overcrowded boats reached the inner harbor,…the boat carrying Bainbridge and several of his officers landed at a pier at the foot of the Bashaw’s Castle. They were driven through the streets – “amidst the shouts and acclamations of the rabble Multitude” – to a passageway “lined with terrific janissaries, armed with glittering sabers, muskets, pistols and tomahawks.” Hurried along through “various turnings and flights of stairs,” they were escorted into an opulent hall, where the walls were made of enameled porcelain and the marble floors covered with luxuriant Turkish carpets. The prisoners were compelled to sit in a half circle before an elevated throne. After dinner the officers were escorted out of the castle…Walking for a short distance through the city, they arrived at the former residence of James Cathcart, the last American consul who lived in Tripoli before the war. The house, they were told, would serve as their quarters for the duration of their captivity….Relief came on the second day, when the Danish consul, Nicholas Nissen, brought mattresses, blankets, and baskets of promegranates, dates and oranges…For the officers, captivity in Tripoli was shaping up to be something like an extended vacation in a tropical seaside resort…The enlisted men of the Philadelphia were not nearly so fortunate. Their plight was recorded by an ordinary seaman named William Ray, a thirty-four-year-old native of Salisbury, Connecticut, … Published in 1808, his account was entitled Horrors of Slavery, or the American Tars in Tripoli. Hours after the surrender of the Philadelphia, the sailors were taken under heavy guard to a damp cell within the walls of the castle….Preble learned of the loss of the Philadelphia on November 24, from the Captain of the Royal Navy frigate Amazon (38 guns),…The night before Christmas Eve, the Constitution was in the offing near Tripoli, running south toward the African coast in company with the Enterprise. Soon after first light, the lookout at the masthead sighted land to the southwest, and a few minutes later hailed the deck again to report a sail on the horizon in the same direction. The Mastico was not a valuable prize…But her economic value was not important. As the officers and men of the squadron celebrated the new year, 1804, Preble had an important mission in mind for the little ketch – a mission that promised, if successful, to bring him one long step closer to winning the war…. 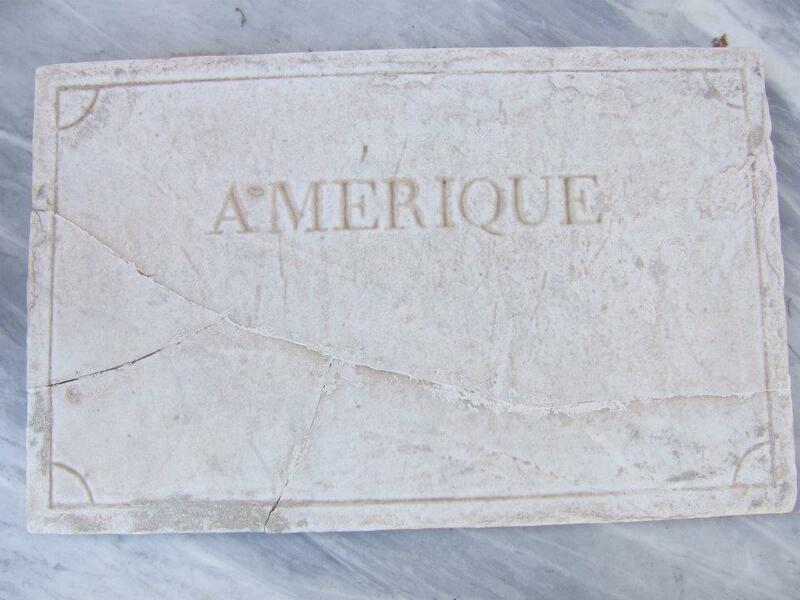 American diplomatic consuls were stationed in most of the major ports of the Mediterranean. They were an unruly and fractious group, often operating with little or no supervision from their punitive boss, Secretary of State Madison. They blended their public duties with private business affairs in ethically troubling ways, and they seemed to devote much of their time to feuding among themselves. For all their flaws, however, the members of this embryonic diplomatic corps knew better than anyone else how to get things done in the Barbary States…. Using a telescope, William Bainbridge had surveyed Tripoli’s harbor defenses from the roof terrace of the officers’ prison house. 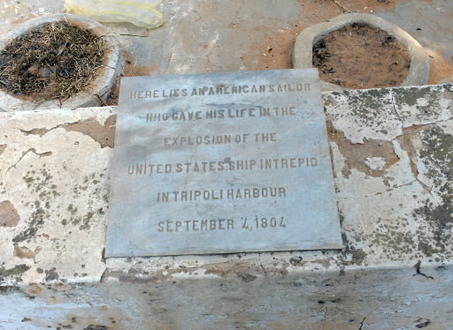 Writing in cipher and forwarding the letters through Consul Nissen…he warned the town could not be taken from the sea…Added to Tripoli’s defenses was the frigate Philadelphia, (soon to be renamed Gift of Allah), now anchored in the main channel about three fourths of a mile from shore…her very existence was a humiliating symbol of American powerlessness in the Mediterranean. The idea to destroy the Philadelphia seems to have occurred independently to several American officers….Twenty-five-year-old Stephen Decatur, commander of the schooner Enterprise, volunteered to take a hand-picked crew and do it himself, and several colleagues later corroborated his claim that the mission had been his initiative…. …When the Intrepid came within hailing distance, her Maltese pilot, Salvador Catalano, called out to the guards in Arabic. He told the story that Decatur had invented. The ketch had come to Tripoli to ship a cargo of livestock for the British garrison at Malta. She had suffered badly in the gale, losing both her anchors, and she needed assistance. Could she have permission to make fast to the frigate for the night? The rail was 10 or 12 feet higher than Intrepid’s, so the men had to climb the hull as if scaling a rampart. Decatur lept first and clung to the fore chains: eighty men were just behind him. So quick and tightly choreographed was the assault that by the time the commander slipped over the bulwark, the frigate’s decks were already swarming with attackers. Some came over the rail, others darted through the gun ports. To keep the noise to a minimum, they worked with edge weapons only: swords, pikes, and knives. No shots were fired. The battle for possession of the Philadelphia was short and savage. Taken by surprise, the Tripolitans made a feeble and halfhearted defense. 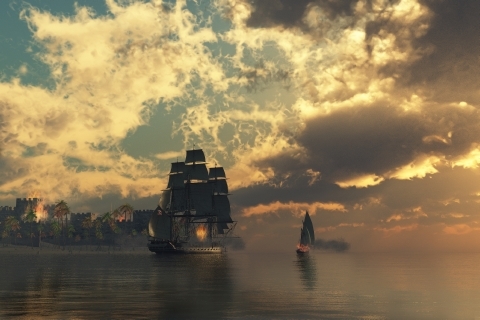 Some ran to the forecastle and others to starboard rail, “whooping and screaming” as they went. A dozen or so scrambled into a boat and rowed to safety. Most simply leapt overboard and swam toward the beach. About twenty men turned on their attackers and fought. As a reward for their courage, they were slashed, hacked, and stabbed, and their ruined bodies thrown into the harbor. The raiding party took only one prisoner, and he was so badly lacerated that he was not expected to live through the night. One American was slightly wounded, none killed. In ten minutes, the fighting was over, and Decatur gave the order to destroy the Philadelphia. Like every other aspect of the mission, the firing of the ship had been meticulously planned in advance. The raiding party separated into squads, each assigned to set fire to a different section…..Decatur waited until the last of his men had climbed down to the deck of the Intrepid, and then followed. Flames were roaring out of the hatchways….As soon as the lieutenant was aboard, the men worked frantically to fend off before the ketch was consumed….Decatur sent a crew around to take one of the boats ahead to row the ketch’s bow around. Her sails filled and she began to make way. An alarm had gone up through the harbor. The Intrepid was taking small arms fire from two xebecs moored nearby, and soon the guns of the castle and harbor batteries came to life. The Americans were fortunate. The enemy cannonade was widly inaccurate – only one shot came close to hitting the fleeing ketch, and that passed through her topgallant sail. Men laid hold of the oars and rowed her down the channel. Once out of range of the enemy guns, they laughed, joked, sang, and paused to watch the spectacle of the still-blazing Philadelphia. …By six the next morning, the men on the deck of the Siren, forty miles out to sea, could still see the light of the distant fire on the southern horizon. …Yusuf took his anger out on the common seamen of the Philadelphia….the officers were taken under guard from the consular house and moved into a securely guarded suite of rooms within the castle…. One of the strangest duels in the early navy was set in motion by an exchange of friendly banter between Stephen Decatur and Richard Somers in 1798, when both were midshipmen serving on the United States under Captain Barry. The two young men were, by their own reckoning, inseparable friends, and as they were joking in the wardroom one day, Decatur laughingly called Somers a “fool.” Neither man thought anything of it until the next day when several of their fellow officers refused to share the wardroom table with Somers. Having talked it over among themselves, they had agreed that Decatur’s use of the term “fool” constituted an insult, and that Somers must either issue a challenge or be ostracized as a coward. Somers and Decatur protested that their bantering had been harmless. Decatur had not meant to suggest that Somers was literally a fool, and Somers had not taken offense at the remark. Decatur offered to host the entire wardroom at a dinner in which the exchange would be explained in fuller detail. Their messmates refused the invitation. Somers’s exasperated response was to issue a challenge, but not to Decatur. Nominating Decatur as his second, he challenged the other officers to fight him in sequence. The multiple challenge was accepted. In the first duel, Somers took a ball in his pistol arm; in the second, he took a bal in the thigh. Decatur offered to take his friend’s place for the third duel, but Somers refused. Bleeding heavily, Somers sat on the ground while Decatur propped up his pistol arm. After the third exchange of gunfire, all agreed that Somers had resolved any doubts about his courage, and the business was called off…. Bashaw Yusuf was enraged by the destruction of the Philadelphia, but he was also perplexed. Who were these Americans, who seemed so intent upon persisting in a costly and unproductive war? …Preble was showing interest in a scheme that had been under discussion among America’s Mediterranean envoys for several years. The idea was to lend financial and military support to Yusuf’s exiled older brother, Hamet, who had a competing claim to the throne of Tripoli. Yusuf had seized power in the same way that previous generations of Karamanlis had – by slaughtering all his rivals, and not sparing his blood relatives. Hamet had been lucky to escape with his life. In June 1775, Yusuf had tricked his older bother into leaving the city on a gazelle-hunting expedition, and then seized power in a coup d’etat and closed the gates against Hamet’s return. Gunboat No. 2 was commanded by Decatur’s younger brother, James…The Tripolitians who were left standing hauled down the colors, and James Decatur ordered his men to cease fire. As he stepped across the gunwales to take possession of the surrendered boat, one or more muzzles were raised and fired. Decatur took a musket ball to the forehead and fell between the boats. As the Americans rushed to fish their fallen commander from the sea, the surviving Tripolitans took hold of their oars and started pulling for the inner harbor. As Stephen Decatur’s gunboat No. 4 was pulling back to the safety of the flagship, with her captured vessel in tow, she came within hailing distance of No. 2. From Midshipman Thomas Brown, Decatur learned of the sham surrender, and then looked down and saw his younger brother, shot through the head....Decatur was undermanned but he none the less bore away and chased the fleeing enemy. For the second time that afternoon Stephen Decatur boarded an enemy vessel. Nine men followed him. It was a rash action – there were twenty four defenders aboard and they were willing to fight…As Decatur exchanged blows with the Tripolitan commander, his (Decatur’s) cutlass broke just above the crossguard, leaving him defenseless. The two men grappled and fell to the deck, sprawling across the gunwale. The Tripolitan drew a yatagham – a long, curved Turkish knife – and was on the verge of plunging it into Decatur’s exposed chest when the lieutenant found his pistol and fired it into his antagonist’s side, mortally wounding him. Four more Tripolitans were advancing on the still prone Decatur and were about to cut him to pieces when the lieutenant’s personal servant and a marine private rushed into the fray, armed with a tomahawk and cutlass. They fell upon the four and killed them all…. The event seemed to stun both attackers and defenders, all guns fell silent for several minutes….The explosion of No. 9 was a major blow to the squadron’s fortunes. Ten Americans were killed instantly, including James Caldwell and Midshipman John Dorsey. Six others were wounded; four critically and two mortally. Preble attributed the explosion to a direct hit by a red-hot shot from one of the shore batteries, but it was more likely that the magazine was touched off by flaming wad from No. 9’s bow gun….The battle continued for two hours. The Tripolitians fought on with renewed ferocity…. Preble placed his last hopes in a plan to destroy the Bashaw’s gunboats by sending a “fireship” into Tripoli’s inner harbor. A small crew would navigate a vessel crammed with powder and incendiaries into the heart of the enemy’s anchorage. Once in position, the men would light slow fuses and then flee to safety in two fast rowboats. When the fireship detonated, the explosion would lay waste to everything within a quarter-mile radius. Or so it was hoped. The vessel chosen for this mission was the Intrepid, the captured Tripolitan ketch that had been employed in Stephen Decatur’s successful mission to destroy the Philadelphia the previous February. Carpenters from several different vessels in the squadron were detailed to make the necessary alterations. Intrepid’s magazine was crammed with fresh gunpowder – nearly one hundred barrels, or 5-tons, and then tightly planked over. One hundred and fifty mortar shells were stacked on a tier above the magazine. Small holes were drilled in the bulkheads for the fuses, and then troughs of trains of gunpoweder were run to the bow and stern. Once lit, the trains and fuses were supposed to burn for eleven minutes before touching off the payload. It was well understood by both the officers and the seamen that the fireship mission would be extremely perilous. The Intrepid, literally a floating powder keg, would have to be sailed into the heart of the enemy flotilla, well within range of more than a hundred hostile guns. A direct hit would very likely detonate the magazine and blow the entire crew to kingdom come. Under no circumstances could the Intrepid be surrendered, since her 5-tons of gunpowder could in that case be used to resupply the enemy’s shore guns. If she were boarded and carried, it would be converted into a suicide mission, the crew would have to touch off the magazine. In spite of these sobering considerations, Preble was inundated with volunteers. Every single officer in the squadron wanted to go, and some lobbied the commodore directly for the assignment. Preble thought it fair to choose officers who had been disappointed not to participate in Decatur’s mission to destroy the Philadelphia. The fireship mission would be commanded by Decatur’s old friend, Richard Somers; he would be accompanied by two other officers and ten enlisted men…. Final preparations were made for the fireship attack. The volunteers wrote out their last wills, specifying which of their shipmates would inherit a jacket, a tarpaulin hat, or a pair of duck trousers. At eight o’clock the next morning, Intrepid slipped her moorings and sailed in toward the harbor, borne along by a soft northeast breeze. The Tripolitan lookouts saw her enter the western passage, and two shore guns were sounded as an alarm. Then all fell silent, and the darkness obscured her next maneuvers. At 9:47 p.m. there was a flash of light, followed by an enormous explosion. “How awfully grand!” Midshipman Spence exclaimed. “Everything wrapped in dead silence made the explosion loud and terrible. The fuses of the shells, burning in the air, shone like so many planets. A vast stream of fire, which appeared ascending to heaven, portrayed the walls to our view.” Several of the mortars detonated late, some at a height of 300 feet. “For a moment, the flash illuminated the whole heavens around, while the terrific concussion shook every thing far and near,” Midshipman Ridgeley wrote. “Then all was hushed again, and every object veiled in a darkness of double gloom.” From the deck of the Constitution, men could hear the terrified cries from the inhabitants of the town and the low roll of kettledrums beating out an alarm. The squadron waited for the two rowboats in which the Intrepid’s crew were to have made their escape. Hours passed. Preble ordered sky rockets fired at ten-minute intervals. As the first blue glow of dawn broke on the horizion, lookouts at the mastheads scanned the horizon. There was no sign of the Intrepid or her boats. Hope faded.